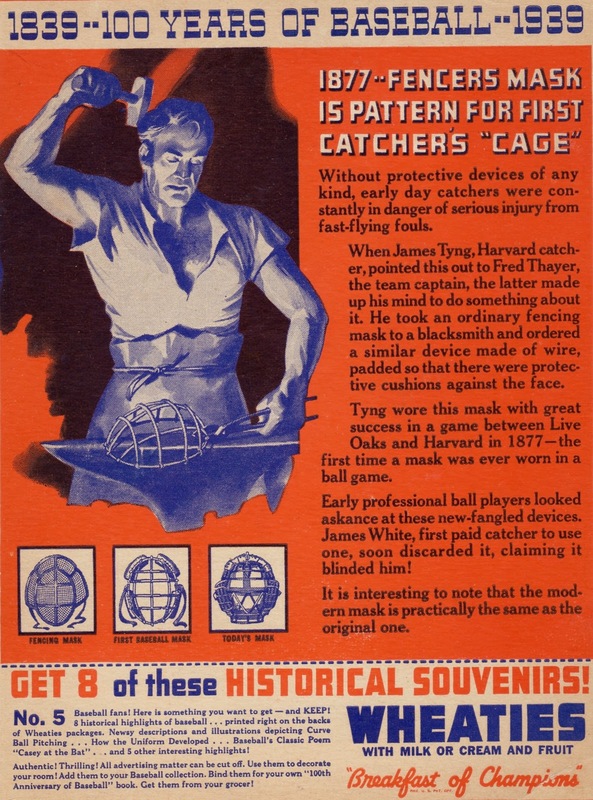 Today's #5 tracks the genesis of protective masks for catching, first donned by Harvard's backstop for a cross-state game in 1877. 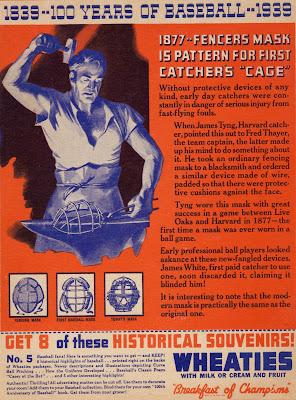 Catchers of all eras deserve respect for a willingness to field baseball's most hazardous position and their gear's nickname--"the tools of ignorance"--says more about the gritty mentality needed than any shortage of smarts. I think of this set as an early poetic history, focusing on fan-visible shifts in play. Without recognized players, there's not much collector interest, but it does demonstrate Wheaties' willingness to try out different ideas. Its checklist numbers eight panels. Value: This mid-grade panel cost $10 on eBay in 2006 and others should run the same, excepting perhaps Lincoln and his Americana appeal. Fakes / reprints: Haven't seen any in the marketplace and it'd be an odd choice to reprint. 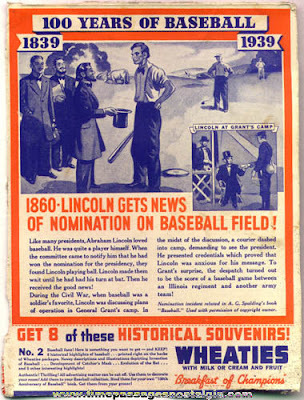 UPDATE: By request, here's a scan of #2, the Lincoln panel, from TimePassagesNostalgia.com. I'd love to see what the Lincoln one looks like... great post. It was very informative. You got it! Found a scan of Mr. Lincoln and updated the post. Thanks Matthew... that's pretty cool. One of those things that would look sweet... framed and mounted in my office. Do they pop up on eBay fairly often? Good question--haven't looked in a while, since #5's already in my hands. Just did a search, but no Lincolns in the results. Perhaps they come around, though!